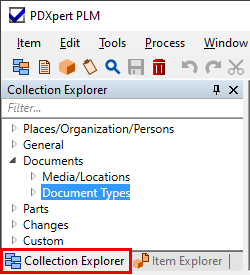 If the Collection Explorer is not displayed, select the Collection Explorer menu item from the Window menu. If necessary, click on the Collection Explorer tab to bring the Collection Explorer to the front. Navigate to the collection of interest. If necessary, expand a collection section (for example, the Documents section) by clicking on the group's expansion arrow. Select a collection within the section by clicking on it (for example, the Document Types collection). You can display all members of the collection by clicking on the collection's expansion icon. The default member is displayed in bold font, and is assigned to new objects as they're created. Use the context menu to add new members and refresh the list from the database. Set the member as the default member. Delete the member, if it's not already in use by another collection member or an item record. To find a collection member, enter the name into the Filter… box. A collection can also be filtered by its abbreviation, display name or material CAS, which is shown in parentheses, like Assembly (Assy).